It was a sad day when Harry Potter and The Deathly Hallows-Part 2 was released, knowing that it was the end of an era. Warner Bros. is turning out to be what I would consider one of the smartest studios around. 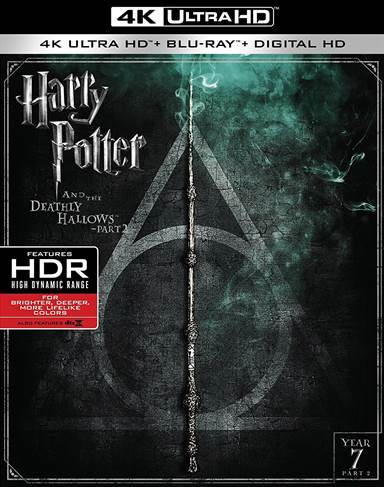 Not only did they work with J.K. Rowling to provide one of the world's most popular movie franchises to people of all ages, but they have made the best business decision to bring the Harry Potter movies to 4K UHD. Harry Potter and The Deathly Hallows- Part 2 was originally shown in movie theaters in 3D- the only Harry Potter movie to be done in such a way. This 4K version, while without the 3D, is as captivating. The clarity and details that "pop" in the 4K resolution makes the viewer breathless and captivated watching the movie all over again as if it's the first time. Harry Potter and The Deathly Hallows- Part 2 picks up where Part 1 leaves off- with Harry (Daniel Radcliff); Hermione (Emma Watson; Beauty and The Beast); and Ron (Rupert Grint; Harry Potter franchise) on the continued quest to find the remaining Horcruxes and destroy them. They've already used the Sword of Gryffindor to destroy one but the remaining Horcrux' will test the bounds of brotherhood, friendship, and family, as Lord Voldemort (Ralph Fiennes; The English Patient) and his band of Death Eaters infiltrate the Ministry and Hogwarts. Enemies abound, but when the ultimate battle between Harry and Voldemort is inevitable, allies from the most unexpected places appear. Compliments go to the late and great Alan Rickman (Robin Hood) who created such a persona in Professor Snape that the ultimate betrayal is still as shocking on screen as it is in the movies. It's a lesson when we realize that things are not "always" as they seem. Watching the final movie in this franchise, after watching all of them, shows how mature these actors have become. Radcliffe, Watson, and Grint were all just children when they started their coveted roles in The Sorcerer's Stone. To watch them mature and really own their roles, especially in what I believe is the most adult storyline in the entire series- shows what determination and commitment these young actors have to their roles. Clearly, ensuring that Director David Yates (Fantastic Beasts and Where to Find Them) continued his position of the prior two movies, directed the final movie in the Harry Potter series, kept consistency within the last few movies with not only the direction of the films but with these actors. Yates' insight into the depth of emotions needed for not only the final scenes but the continued tests of friendship and maturity in children that have seen too much darkness in a world in which they have become the adults far too soon is absolute. J.K. Rowling clearly was able to bring the final half of the seventh book to the big screen without losing the impact of the storyline, the final battle, and the secret that bound Harry and Snape forevermore. The newly released 4K UHD Blu-ray edition is presented in 2.39:1 theatrical aspect ratio. In contrast to the 1080p HD Blu-ray included, the 4K UHD picture quality is sharper and crisper, although if you've never watched 4K, the 1080p HD Blu-ray is also a wonderful picture. Frankly, since the colors in this film are particularly muted compared to the prior films, due to its deep storyline, the 4K qualities provide more clarity and contrast in the blues, grays, and blacks. There is an apparent difference in the battle scene and the 4K provide the colors hues needed to really accentuate the impact of the battle scene. The English DTS:X audio quality on the 4K is very pleasing to the ear. While I still think that some of the exceptional sound quality is lost without a sound system, the benefits of the DTS:X audio in this particular movie is beneficial to the listener. The DTS:X provides an impactful battle scene, providing distinct battle noises that provide much-needed support for those particular scenes. In addition, this is in no way to take away from the clarity in the dialogue provided by this advanced sound quality. When you purchase the 4K UHD Blu-ray edition, not only will you get the movie presented in 4K UHD, but the movie on a Blu-ray presented in 1080p, as well as a dedicated Blu-ray for the special features. While all the bonus features are also found in the prior Ultimate Collector's Edition, they are always fun to watch. On the dedicated Bonus Blu-ray, most all of the almost 4 hours of the following extras are presented in HD, but a few are shown in SD. It was a sad day when Harry Potter and The Deathly Hallows-Part 2 was released, knowing that it was the end of an era- knowing that there would not be a movie to follow. Yet, Warner Bros., Yates, and Rowling having teamed up to bring such a story to the movie theater and now, into our homes, and keep the integrity of the tale, is an incredible feat. Throughout the series, the actors become the characters and we loved them for doing exactly that. Harry Potter is a household name and every child- and even some adults- will wait eagerly for their letter from Hogwarts. Rowling opened up a fantasy world for children and adults alike and created an interest in reading and movies that hasn't been seen in quite a while- maybe not even ever before. We will be forever grateful for the creation of the world of Harry Potter.